What is the one chore that new mothers dislike? If you guessed washing a cloth diaper, you are not wrong. Here is a Beginner’s Guide: How To Wash A Cloth Diaper. True that it is a boring job, but remember; washing them with care is just as much important as wrapping your baby in the diaper. We assume you believe in following the healthy way of keeping your baby wrapped, that is you chose cloth diaper over the disposable ones for your newborn. But with healthy practice also comes some extra work – of washing cloth diapers at home. In case of the wet pail method, you need to soak the cloth diaper in water contained in a pail. Soaking them in water shall help remove all stains. In case of the dry pail procedure, the soiled and wet cloth diapers are placed in a covered pail. There is no need to pre-soak the diaper in this case. Control the odor coming from the diaper with baking soda. To get a fresh smell, add a few drops of tea tree oil or lavender oil in the pail. This can be an effective way to mask the pungent odors. It is better to use hot water for washing and then warm water for rinsing. Make sure not to use softeners while washing them, as it reduces the absorbing capacity of diapers. Also, ensure you do not use too much detergent as it can leave remnants. Do rinse the diapers thoroughly before allowing them to dry. Line drying the diapers increases their life; however, consider spin drying them at times. 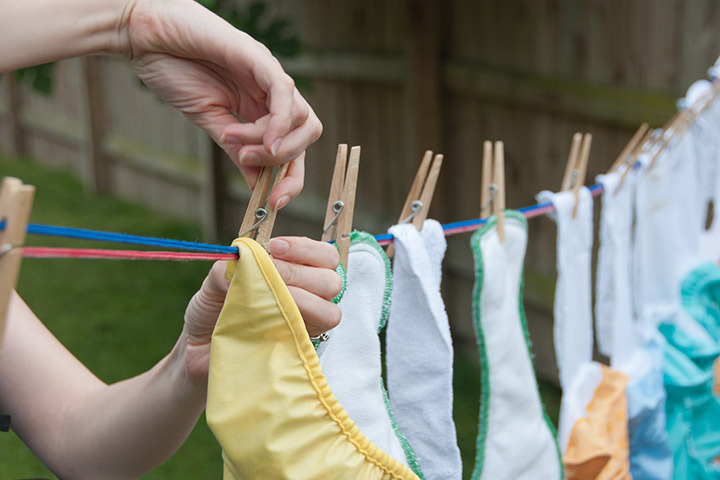 Drying the cloth diapers under the direct sun is the best way to get rid of stains. Sunlight acts as a natural bleach and helps in the fading of tough stains. If you use stain removal solutions like oxygen-based bleach, you run the risk of harming the baby. The chemicals harm elastic of the diaper and damage the waterproof layer as well. Wash the diapers thoroughly at least twice to ensure all traces of chemicals are removed. To get rid of the residues from the diaper, wash the diaper in hot water for 4 to 6 times without detergent. You need to opt for RLR Laundry Treatment when you find residue that is hard to wash off. You may add 1/4 cup of vinegar while washing the cloth diapers in the first or second cycle. Did you find the information on best way to wash cloth diapers helpful? Tell us how do you wash cloth diapers of your little one in the comment section below. Simultaneously, do share this article with your friends and family.